TopTier introduces a breakthrough maintenance and operations tool at PackExpo 2016. The Perpetual Monitoring System incorporates video cameras strategically positioned to monitor palletizer operations. Palletizing is a complex process impacted by many variables often outside the control of the palletizer. Perpetual Monitoring is an effective tool for identifying issues which compromise reliability. Once identified using video evidence, corrective steps can be taken to increase reliability of palletizing operations. 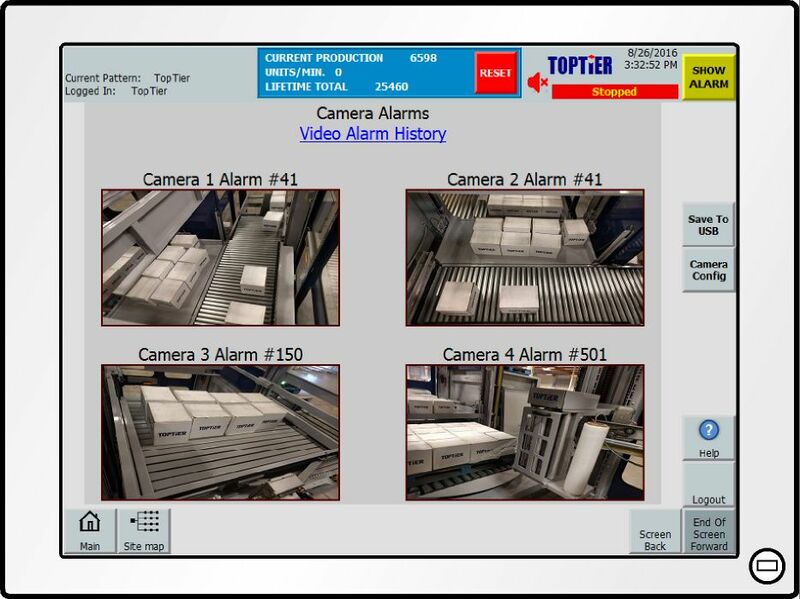 Integrated video cameras continually monitor palletizer operations for case count and turn, row building, layer conditioning, and deposit. Primary palletizer operations occur in each of these zones. Product defects or palletizer timing sequence issues with pattern parameters can compromise reliability. The Perpetual Monitoring System displays videos of recent operations in each zone. Perpetual Monitoring provides a diagnostic tool previously unavailable to the industry. 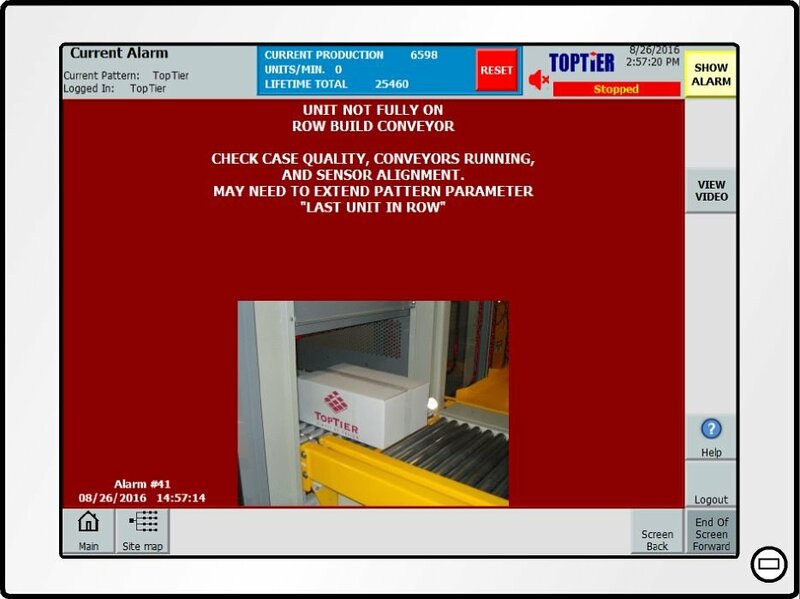 Whenever an error message is generated by the palletizer controller, a screen defining the issue source is automatically displayed at the HMI. By selecting the video icon, video of the impacted zone operations five seconds prior to and three seconds following the error event is displayed on the HMI screen. Video is also queued for viewing from all cameras whenever the controlled entrance palletizer safety cage access button is pressed. 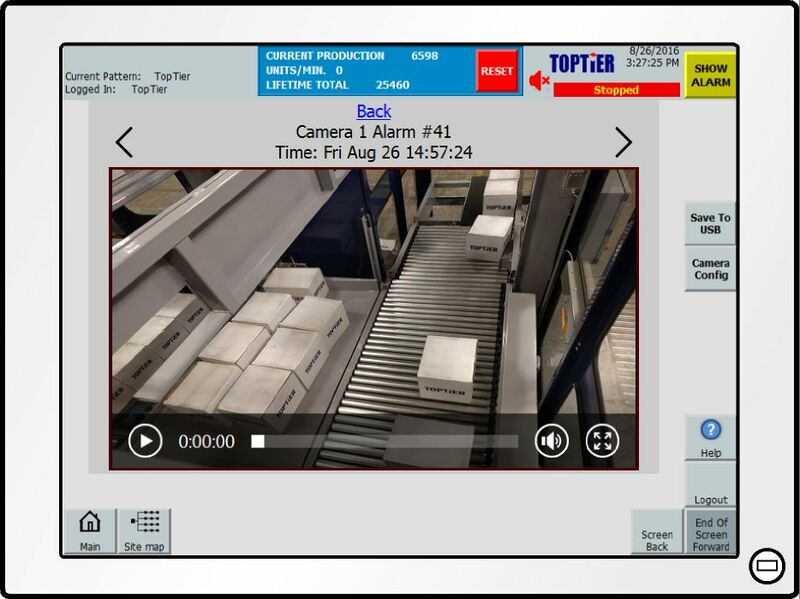 Video icons are displayed at the HMI screen allowing any selected palletizer zone operations to be viewed for five seconds prior to and three seconds following the operator decision to access the palletizer. All error generated video clips are automatically saved. Queued video from error message or operator entrance events are saved based on time stamp and camera location. Supervisors or maintenance personnel can then monitor all events for a shift or other period of time as deemed appropriate. Palletizers equipped with concurrent wrapping include a fourth camera to monitor all film dispensing operations. The length of pre and post entrance video clip lengths can be modified. Palletizer controller stored videos can be directly accessed by a plant host computer for viewing or archiving. Videos can also be transferred to a pen drive from the HMI USB port. Should a problem persist, videos can be transferred to TopTier support personnel for diagnostics assistance.